Be sure to check out the Ice, Wind and Antenna Load Specifications for your area that determine Maximum Self-Supporting 25G Tower Height. 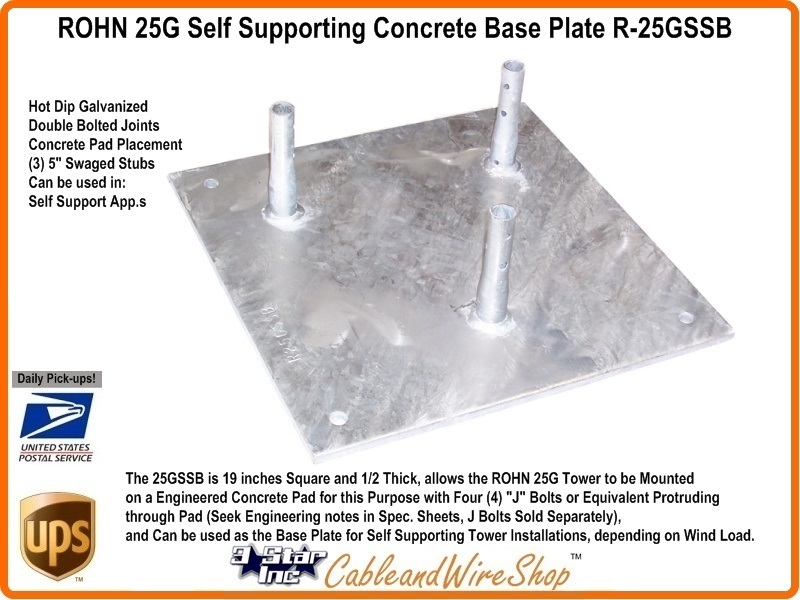 ROHN Products, LLC manufactures a Variety of Compatible Galvanized Steel Base-Plates to Facilitate Installation of your ROHN 25G Tower onto any Type of Foundation Requirement you may have. Foundation and Base Plate Engineering Documentation Provided by ROHN is available here as a Resource, but is by no means complete by itself or a susbstitution for Engineering Conducted Specific to your Application. When Selecting a Base Plate for Your ROHN 25G Tower that will affix to an existing Structure or Foundation, please evaluate that Structure or Foundation as being conducive to the Plan you envision. As always, Consult your Local Structural Engineer, Building Code and NEC for guidance to Properly Installing and Grounding your ROHN 25G Tower Installation. ROHN Products, LLC manufactures Mounting Brackets to Attach to, and derive Support from, other Load Bearing Structures in the immediate vicinity of your ROHN 25G Tower in both Self-Supporting and Guyed Installations. These 25G Brackets are all Solid Galvanized Steel and could possibly convey considerable Load to the Structures of which they are attached. Assure yourself through Investigation that the Structure you wish to Bracket to will handle the ROHN 25G Tower's Load transferred to it as is, or can be Supplemented in some Engineered fashion as to match and counter the Load applied. As always, Consult your Local Structural Engineer and Building Code for guidance. ROHN Products, LLC manufactures Mounts to Facilitate Attachment of Popular Antenna Designs for a Multitude of Applications, including but not limited to; Wireless Internet, Amateur Radio, Cellular Telephone, SCADA, Telemetry, PCS, Microwave Point to Point, Microwave Point to Multi-Point, MDS, MMDS, Broadcast, Off-Air TV, Satellite TV, DBS, WI-FI, Business Band or CB Antenna Installations. Most Antenna Mounts and Top Cap Section Design differences involve the Diameter and Length of the Masting used, or to be applied for Use with the Particular Antenna Dimensions and Wind Loading involved. Wind Loading, Antenna Loading and Wind Survivability ratings vs. Height Documentation Provided by ROHN is available here as a Resource, but is by no means complete by itself or a susbstitution for Engineering Conducted Specific to your Application. Contact Us with any Questions you may have regarding Use prior to Purchase. All Information regarding the ROHN 25G Tower line, Parts and Accessories is as accurate and complete as we can possibly provide given that this Resource Offering is subject to change without Notice and is beyond Our Control. 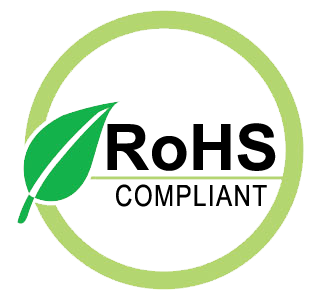 This Buyers Guide will answer many questions you may have on this Product Line. For more detailed information and Specification Sheets covering many aspects of Various Parts, Accessories and Installation Scenarios... Please refer to the "ROHN 25G Tower" Link appearing in the Footer of this Page Below! ROHN 25G Adjustable House Bracket HB25CG 0-36"